We have all tried to make a good impression before. Whether it’s a job interview, the first day of school, or meeting a significant other’s parents the prospect can be rather daunting. Why Him? is interested in the latter and follows the old family meets inappropriate boyfriend structure, but this time the premise has been updated to fall in line with today’s standards – or lack of – with crude jokes fitted in at any available moment. The film centres around Stephanie (Zoey Deutch), a university student, who invites her family consisting of parents Ned Fleming (Bryan Cranston), a local print publisher whose business is struggling to adjust to the internet age, and Bard (Megan Mullally), as well as preppy younger brother Scott (Griffin Gluck), to stay with her and tech-millionaire boyfriend Laird (James Franco) in California over the Christmas period. Laird is unfiltered and overbearing, with every other word coming out of his mouth seemingly an expletive. Ned is much more uptight and over the course of the film Laird, covered in some questionable tattoos, attempts to convince him that he is right for his daughter. The plot does seem oddly similar to Meet The Parents, and it will come as no surprise that director John Hamburg was the writer behind the Fockers franchise. Why Him? 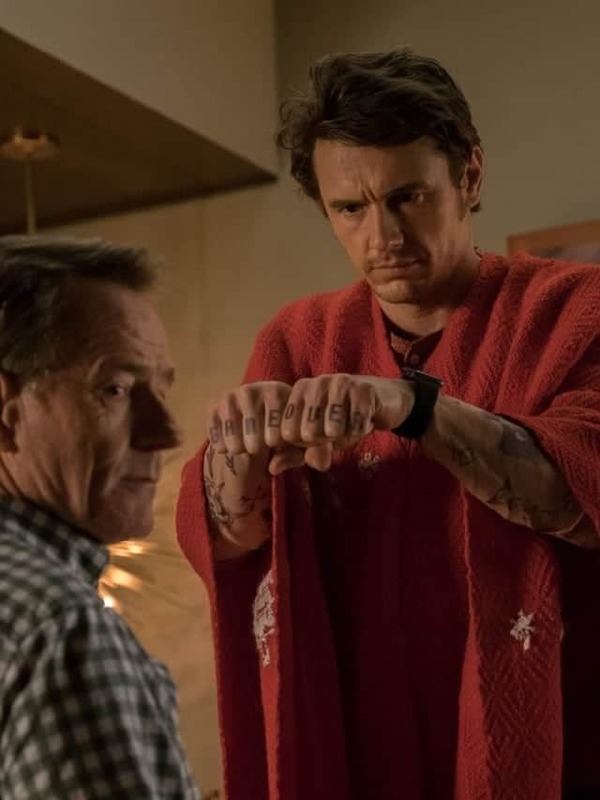 has a pretty good cast, and both Bryan Cranston and James Franco have strong comic performances in their filmographies. They make the most of the material at hand and squeeze as much laughter as possible from the uneven script. There are attempts to add depth to both characters, in the form of business pressures and parental absences, but neither feel sincere when the underlying premise is unbelievable and where plot points are delivered with a complete lack of subtlety. It is a shame too that the female characters are underdeveloped. Megan Mullally is involved in many of the most humorous moments, but still feels like nothing more than a comic add-on, as little is known about her other than she is Stephanie’s mother and a fan of the band Kiss. Zoey Deutch, who was last seen in Richard Linklater’s Everyone Wants Some! !, is little more than the pretty-college-girl stereotype, despite being an intelligent Stanford student. Even though it was unsuccessful, attempts were made to add complexity to the male roles and it is disappointing that the same can’t be said of the female characters. The best comedies make us care and sympathise for those on screen and this film never manages to do that. In terms of pure comedy and laughs per minute Why Him? does surprisingly well. There are far too many so-called comedies that have failed to assume me over recent years and the ability to make an audience laugh is a much bigger achievement than we often admit. The jokes about the generational divide between Ned and Liard are surprisingly sharp and well observed. Rarely do these moments revert to cliché and some scenes could even be described as satirical. In the end Why Him? has some amusing moments even if the story itself doesn’t hold together. It may not be the kind of film you’d want to see with your parents but I could imagine an enjoyable afternoon being spent watching it with friends over the festive period. Call me immature but I did find Why Him? funny. Why Him? Is in cinemas from December 26th.